Home > News > Product Knowledge > How to Repair the Roll Crusher? 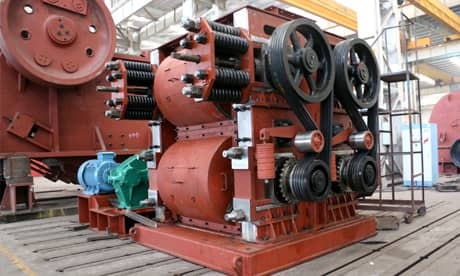 How to Repair the Roll Crusher? There are two common methods for repairing roll crusher rolls: in-situ overlay welding and in-situ cutting (grinding) machining repair. (1) In-situ overlay welding. In-situ welding is the welding filling at the worn notch. This method is simple and practical, does not affect the production, and the hardness and wear resistance of the surfacing part are relatively good. The disadvantage is that it is only suitable for rollers with good weld ability (such as cast steel rolls). Pay attention to the following matters during surfacing: ① The selection of the surfacing electrode should be appropriate, so that heap 256 and heap 266 should be used. ② It should choose small-diameter welding electrode, small current welding specification, layered surfacing. This reduces thermal stress and avoids severe deformation and cracking. ③ During the surfacing process, the surfacing part should be inspected frequently with a straight-line model to ensure that the dimensions are qualified. ④ The grounding of the welding machine should be placed directly on the roll, not on the shaft, so as to prevent current from flowing through the rolling bearing, causing sparks, causing the bearing rolling elements and the surface of the raceway to burn. (2) In-situ cutting (grinding) processing method. The in-situ cutting (grinding) processing method is to install a special tool holder on the frame of the twin-roll crusher, and the moving track should be with the roller. The axes of the cylinders are parallel. When the repair is started, the crusher is started, and the roll is cut by a manual feed mechanism (conditional automatic feed mechanism can also be used). The following points should be noted when applying this method: ① The trajectory of the tool holder is parallel to the axis of the roller to avoid taper after cutting and affect the crushing effect.② Control the speed of movement of the roller. The line speed of the surface of the roller should not exceed the allowable cutting speed of the cutting tool, otherwise the speed reduction measures should be taken to avoid damage to the tool. ③For high-hardness rolls, the cutting cannot be processed. In this case, the grinding head can be ground by the cutting method.